Looks at one of the most fundamental of our species' distinguishing characteristics: the use of language. The author argues that our language abilities are part of our genetic inheritance, not a cultural artefact, and that language is a basic human instinct. 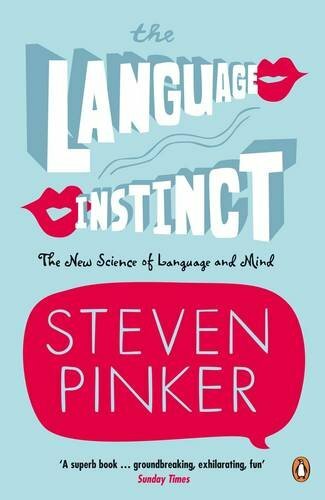 Amazon.com description: Product Description: Steven Pinker's The Language Instinct: The New Science of Language and Mind is a groundbreaking study of language's origins as an evolutionary adaptation. How do we 'know' how to speak? In his landmark book Stephen Pinker shows how language is part of our genetic inheritance rather than a cultural creation. From the DNA that builds our brains to the pontification of newspaper columnists, Pinker destroys the myths about language - that children learn to talk by copying their parents, that grammatical standards are in decline, that English defies logic - revealing the innate human instinct to communicate that we are all born with. 'Reading Steven Pinker's book is one of the biggest favours I've ever done my brain ... highly accessible to the general reader yet at the same time seminal for professionals ... exhilaratingly brilliant' Richard Dawkins 'An extremely valuable book, very informative, and very well written' Noam Chomsky 'Brilliant ... Pinker describes every aspect of language, from the resolution of ambiguity to the way speech evolved ... he expounds difficult ideas with clarity, wit and polish' Observer 'Dazzling ... Pinker's big idea is that language is an instinct, as innate to us as language is to geese ... Words can hardly do justice to the superlative range and liveliness of Pinker's investigations' Independent Steven Pinker is a best-selling author and Professor of Psychology and Director of the Center for cognitive Neuroscience at MIT. Pinker has been awarded research prizes from the National Academy of Sciences and the American Psychological Association, graduate and undergraduate teaching prizes from MIT, and book prizes from the American Psychological Association, the Linguistics Society of America and the Los Angeles Times. He is the author of How the Mind Works, The Blank Slate, The Better Angels of Our Nature, and The Language Instinct.